You are here: Home » etfs » Are The Bears Going Into Hibernation? Are The Bears Going Into Hibernation? Stocks have taken investors on an interesting ride over the last three months. During that time, the S&P 500 is up more than 4%. On the way from then to now, the large cap index suffered a 10% correction. 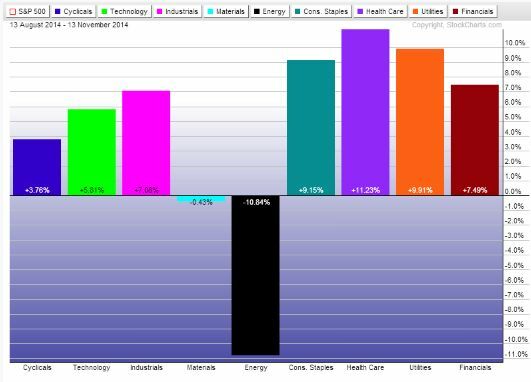 Over the last three months, the sector with the biggest losses is energy. The stocks comprising the energy sector in the S&P 500 are down a whopping 10.8%! This is clearly the result of falling oil prices. Amazingly, the price of crude oil has dropped 28% from its peak of about $107 per barrel to around $77 today. This is causing some pain for oil companies that are more profitable when oil prices are higher. And it’s also creating volatility in the currency markets. Countries like Canada, Russia, and Norway that are big exporters have seen the value of their currency fall in relation to the US Dollar. Consumers in the US are feeling the effect of lower oil prices at the pump. Gas prices have fallen more than 25% since April and are nearing a four year low. That drop in energy cost is a big reason why all of the other sectors are up so much over the last three months. Needless to say, consumer stocks will be a direct beneficiary of the drop in gas prices. The less money they spend at the pump the more they have to spend on everything else. But we’re also seeing the impact of lower oil prices on industrials and financial stocks as well. Don’t forget that some estimate the current drop $30 drop in oil prices provides a $1 trillion stimulus to the world economy every year. Right now the bears are feasting on the energy stocks because of the drop in oil prices. But the selloff is reaching an end if it hasn’t already done so. We’ve already seen oil and gas stocks tick up while oil prices have moved lower this week. Once the bears are done with energy, they better go into hibernation. Because the overall impact of lower oil prices will provide a lift to global economic growth. It’s the type of boost that should help lift stocks across the board.